This article will guide you on how to connect to a "hidden" wireless network using your Linksys Wireless Manager Utility. 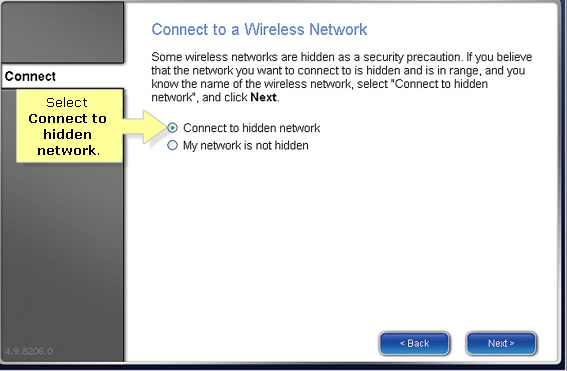 A "hidden" wireless network is a network whose router’s SSID Broadcast configuration is set to disabled. 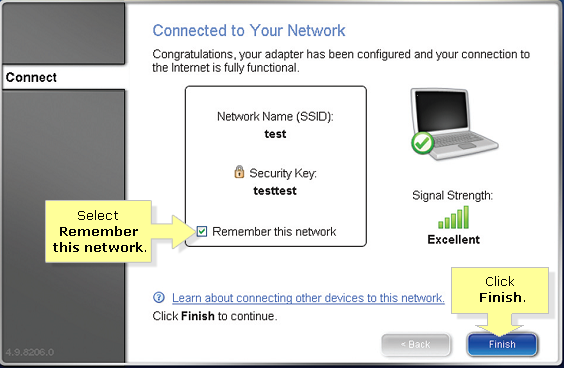 NOTE: By default, a router’s wireless network broadcasts the Wireless Network Name (SSID). 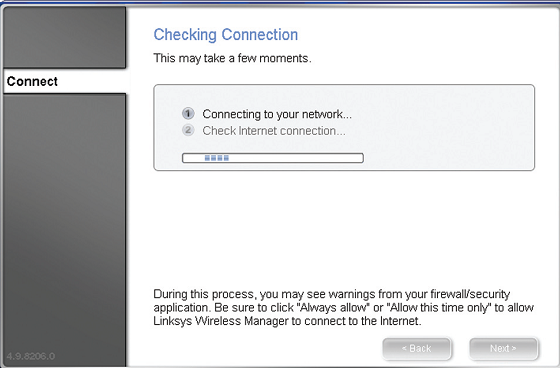 Open the Linksys Wireless Manager Utility. For instructions, click here. 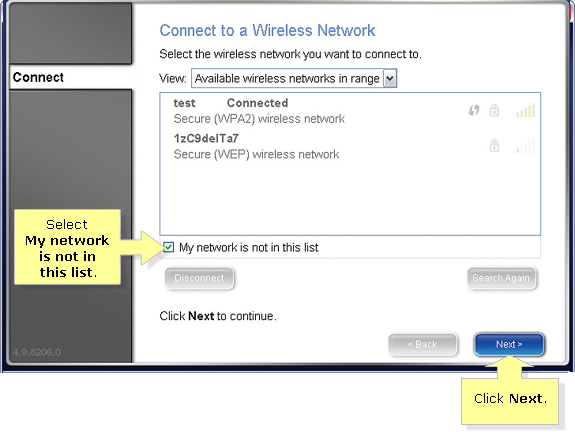 On the Connect to a Wireless Network screen, check the My network is not in this list checkbox. Click Next. If your network is hidden, select Connect to hidden network. Click Next. 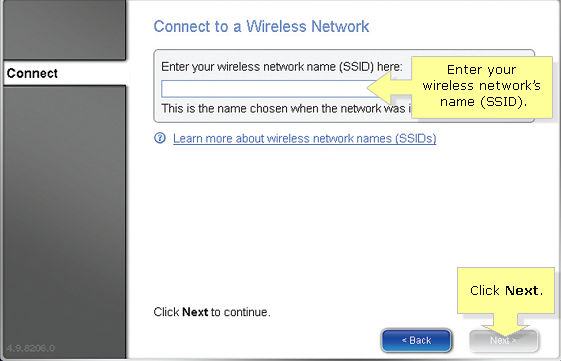 Enter your wireless network's name (SSID). Click Next. 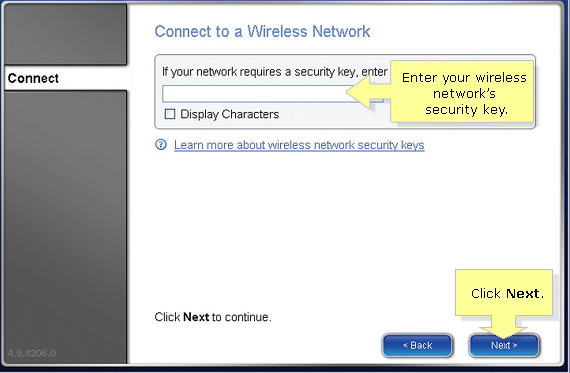 If your wireless network is secured, enter your wireless network’s security key, and then click Next. If your wireless network is unsecured, leave the security key field blank and click Next. NOTE: Make sure you entered the correct key because it is case-sensitive. When the Checking Connection screen appears. Wait until the utility finishes checking the connection. Click Next to proceed. When the Connected to Your Network screen appears. If you want the Wireless Manager to save your wireless network settings, check the Remember this network checkbox to save the Network Name. Then, click Finish to exit the utility. NOTE: Saving a hidden network's settings will make it easier to reconnect to the network.